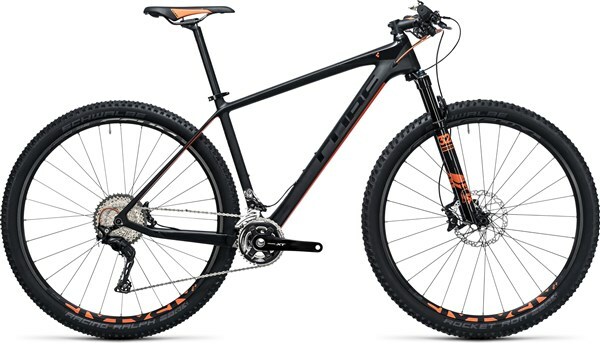 You don’t have to look very hard at the Cube Elite C:62 Pro 29er hardtail to grasp just how lightweight this mountain bike is. The slender frame and ultra-lightweight components are a race-winning recipe any cross-country rider would dream of. C:62 carbon is made from a minimum of 62% carbon fibre. By increasing the amount of carbon, the frame can be made stiffer and lighter without sacrificing strength. Constructed using Cube’s Twin-Mold technology, there’s no excess, and every single fibre is perfectly positioned to do its job. Up front, a Fox 32 Float Performance fork takes care of the suspension, giving 100mm of travel to make sure every lump and bump in the trail is ironed out. The Step Cast design lowers show how committed Fox are to achieving perfection - every little detail helps towards achieving their lightest ever fork. The Cube Elite C:62 Pro is outfitted with 2x11 speed Shimano XT gearing to give a broad range of ratios, shifting quickly and smoothly between each gear. Shimano’s XT name also adorns the brakes, and their legendary power and sensitivity follow suite.